Expelled African National Congress Youth League President Julius Malema addressing the striking mineworkers at Marikana where a massacre of 34 workers took place on August 16, 2012. Malema was speaking on August 18., a photo by Pan-African News Wire File Photos on Flickr. Tensions ran high when members of the EFF and ANC appeared in court on Monday on charges of common assault. Five members of the African National Congress and seven of the Economic Freedom Fighters appeared in separate courtrooms at the Tonga Magistrate's Court, south of Komatipoort, in connection with a fight on Friday, a Sapa correspondent reported. The EFF members, including Nkomazi sub-regional convenor Caleb Sibitane, were not asked to plead and the case was postponed until February 28. They were released on warning. The ANC members, including Tonga ward councillor Nomsa Maphanga, were also not asked to plead and the case was postponed until February 28. They were also released on warning. The cases were postponed for the National Director of Public Prosecutions' decision on how to proceed. The EFF has accused Maphanga of mobilising members to stop an EFF meeting on Friday. EFF national elections co-ordinator Godrich Gardee said the case was being heard in two courts to reduce the risk of confrontation. "We asked the court not to allow the mixing of the members from both parties in one court, because there might be fights," he said. ANC provincial secretary Lucky Ndinisa could not be reached for comment. Plot thickens: Julius Malema was said to be a target of an assassination plot by the ANC by a burglar who woke the EFF leader’s grandmother after he had broken into her home. A 50-year-old Zion Christian Church member who allegedly broke into Julius Malema’s grandmother’s home in Seshego last week will appear in court today. But his claim that he went to the house to pray for Malema as he was being targeted for assassination by the ANC was denied by the ruling party in the province yesterday. The man, who was dressed in his khaki ZCC attire and a badge, allegedly jumped over a security fence, went inside the house and woke up Malema’s grandmother. When she asked him what was he doing there, he said he had to come to pray for the EFF president and commander-in-chief. He reportedly told Malema’s grandmother that he had been informed by angels of God that he had to come pray for Malema because the ANC was planning to assassinate him. It is not yet clear how the ANC would supposedly assassinate Malema. The man has since been arrested and has been remanded in police custody until his court appearance. Provincial police spokesperson Hangwani Mulaudzi said the suspect would appear in the Seshego Magistrate’s Court on a charge of housebreaking. Malema was reportedly at his Johannesburg house and on his way to former boxing champion Jacob “Baby Jakes” Matlala’s funeral at the time of the incident. He had to make a U-turn and rushed to his grandmother’s home to attend to the matter. Malema was the leader of the ANC’S Youth League before he was expelled last year. 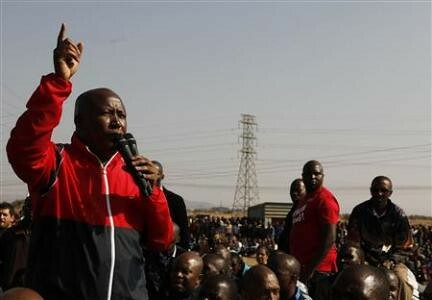 He has since formed a new political party, the Economic Freedom Fighters, which has registered for the polls next year. In its reaction, the ANC in the province has dismissed the assassination claim made by the accused. ANC spokesperson in the province Sipho Dikgale said: “We are very sorry to hear about what happened to the family but we as a party don’t have Malema on our agenda. “We are only focused on winning the elections next year right now,” Dikgale said.